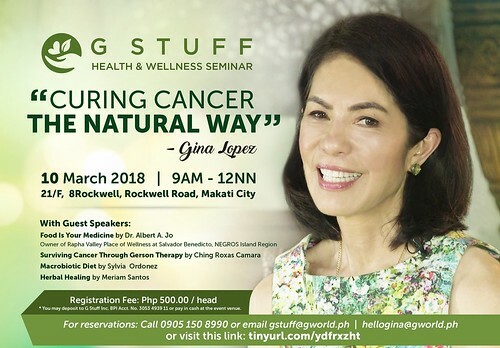 Following the success of her first G Stuff Health & Wellness Seminar for this year held on January 20, health advocate Gina Lopez again invites everyone to her new talk themed — “Curing Cancer the Natural Way.” This will be on March 10 from 9 am to 12 nn at the 21st floor of the 8 Rockwell, Rockwell Center in Makati City. “I am inviting people who have overcome cancer without chemo therapy and radiation — and are alive and doing very well.” says Lopez, who is herself a cancer survivor. Ching Roxas Camara will give a discourse on how she won over cancer through the Gerson Therapy. Sylvia Ordonez will take us to a step by step food intake called the Macrobiotic Diet, which she followed religiously to become cancer-free. Romblon native and true vegetarian Meriam Santos will encourage us on her talk of Herbal Healing which she benefitted from to overcome cancer. Dr. Albert Jo, a Naturopath who helped Lopez when she was diagnosed with cancer and assisted her successfully on her healing, will talk on “Food Is Your Medicine.” He is also the owner of Rapha Valley Place of Wellness in Salvador Benedicto, Negros Island Region. Lopez will make an effort to skype on video Dr. Brent Davis who customized the Beam Ray Programmes for her use on the beam ray, which has a very high rate of success with curing cancer. The cost this time will be P500 to cover the cost of the venue, samples and logistics. Interested parties may deposit to G Stuff Inc. BPI Acct. No. 3053 4939 11 or pay in cash at the event venue. For reservations call 0905 150 8990. You may Email gstuff@gworld.ph or hellogina@gworld.ph or click on this link.